With the veritable bonanza that animation has become in the last decade or so, any reasonable successful property immediately gets sequelized whether there's a particular demand or not. That explains this weekend's top release, which is as much of a “yeah, I suppose” film as any in recent memory. You may vaguely remember Rio, the 2011 animated film about blue macaws in Brazil, which is most notable for someone deciding that the dulcet tones of Jesse Eisenberg was exactly what family audiences craved in their entertainment. As an endangered species, the propagation of his line was paramount in the first film. Now that that's handled with the bird version of Anne Hathaway, it turns out that they weren't quite as endangered as they thought, and it's off to the rainforest to find Hathaway's lost parents. That's right, it's the hoariest of movie tropes, meeting the in-laws. 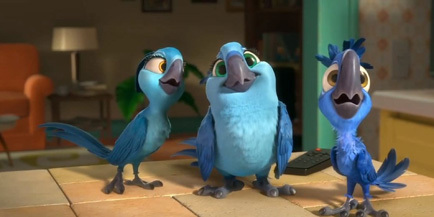 Rio 2 adds the voices of Andy Garcia, Bruno Mars, Jamie Foxx, Kristen Chenowith and Miguel Ferrer among others, along with the returning Jemaine Clement as the antagonist cockatoo of the first film, and Leslie Mann and Rodrigo Santoro as the human handlers, presumably in as irrelevant a role to the film as the first time. Assaulting us once again with the entire Pantone color library, the themes of the film have moved away from letting go of anxiety about growing up, to the joys of parenthood and the evils of habitat destruction. A bit heavy-handed, that one is. Fox is likely banking on a Madagascar like boost in the performance of this film, particularly with the wide range of star voices added to the production, but that's always seemed like a specious idea at best. The first Rio film didn't make much of an impact domestically (though it made nearly $350 million overseas), and it's probably better known from the Angry Birds spinoff than as an actual movie. Family films have been running strongly this year, which is probably the only real reason to feel optimism for this film over and above the audience it's already built, but a weekend of $35 million seems fair here. The first horror film since January makes its way into theaters this weekend in the form of Oculus. The film stars Karen Gillan (of Doctor Who fame) and Brendon Thwaites as a sister and brother in possession of a possibly supernatural mirror, which may in fact be a portal to hell or possessed by the Devil or something, and may have caused their father to murder their mother (played by Katee Sackhoff). While this casting has lots of nerd cred, to horror fans, the bigger deal is likely the tenuous connection it has to the Paranormal Activity and Insidious franchises, which is probably good for a few million.